This is a favorite dinner of ours. John marinated the cod in olive oil, rosemary, bay leaves, lemon zest, and hot paprika. It bakes around 12 minutes in a 400F oven. He also made the polenta which is 1 cup of polenta to 5 cups of water so it is a loose, creamy consistency. My contribution as vegetable lady was to steam the broccoli. We had found some broccoli with stems. Seems like a lot of stores are just selling crowns these days. So I used stem pieces along with florets. I also made a parsley sauce. It’s easy to do – just parsley, a little water, lemon juice and zest plus a olive oil whizzed up with a stick blender. I see that this is the sixth time I’ve posted this cod. Sometimes I serve it with a chickpea sauce and the vegetables vary but it is always a winner. 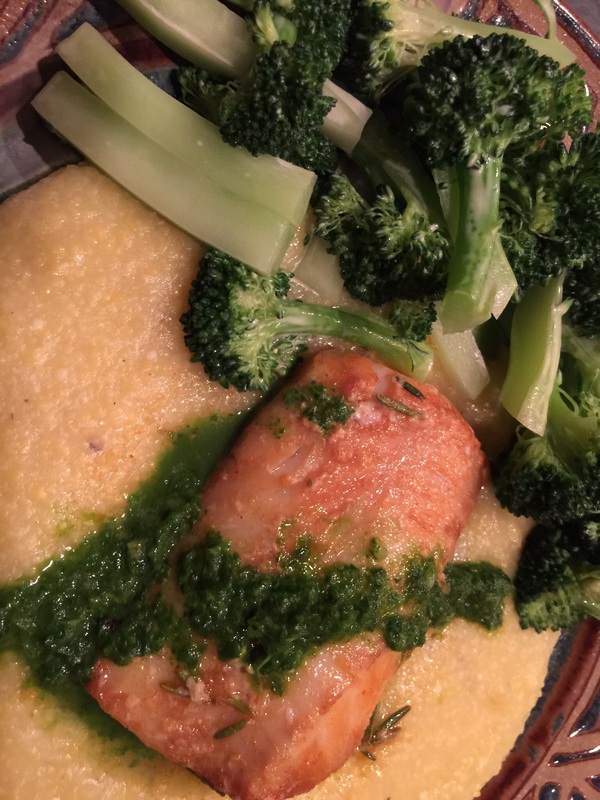 This entry was posted in Fish and tagged broccoli, cod, Pacific cod, parsley sauce, polenta. Bookmark the permalink. Thanks! I took a look at your blog. Your recipes look interesting and the food photography is great!